This 4 day Uganda Savanna wildlife safari takes you to Lake Mburo highway park and Queen Elizabeth National Park, Uganda’s second largest national park, with plenty of wildlife, birds and primates. This park also has spectacular sceneries including Crater Lakes and rolling savannah plains overlooking the snow capped Rwenzori Mountain ranges. 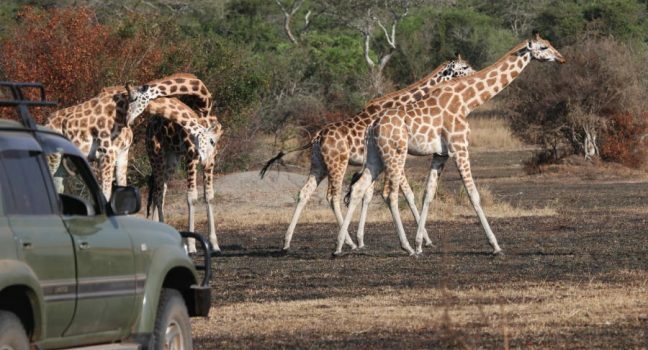 You will enjoy game drives, a boat cruise and The Park contains an extensive area of wetland and harbours several species of mammals including zebras, impalas, elands, topi and buffaloes. The bird population is also impressive including the rare Shoebill stork. This park is the only place in Uganda where Impala can be found and the best place to see large herds of Elands (African’s largest Antelopes). It is also the only park where a guided game walk is possible. You will depart Entebbe in the morning after breakfast and travel westwards through Uganda’s beautiful green countryside to the Queen Elizabeth National Park. The journey will take 6-7 hours with stopovers at areas of tourist attraction such as the Royal Drum makers’ village and the Equator for an opportunity to stand in two hemispheres at the same time. You will continue through the savannah grasslands with lots of banana plantations and several herds of local long horned Ankole cattle endemic to this part of the country. You will get to Queen Elizabeth National Park in the evening. You will set off early (about 6.30am) for a morning game drive, an awesome experience to spot the animals in natural habitats. Expect to see 4 of the famous Big Five; Elephant, Buffalos, Lions, Bush bucks, Kobs, Giant forest hog, Hyenas leopards, antelopes, and Waterbucks as well as birds. You will return for breakfast and relax till lunch. In the afternoon you will take a launch cruise along the amazing Kazinga channel to see, at close range, the water animals to include Hippos, Buffalos, Crocodiles and elephants bathing on the channel banks. There is also a variety of bird species on the water banks especially the famous Shoebill, pelican and Jacana. Any and all tours can be combined or modified to fit your particular needs. Please tell us your specific requirements using the contact us page.